Are community land trusts the answer for cities seeking neighborhood stability? 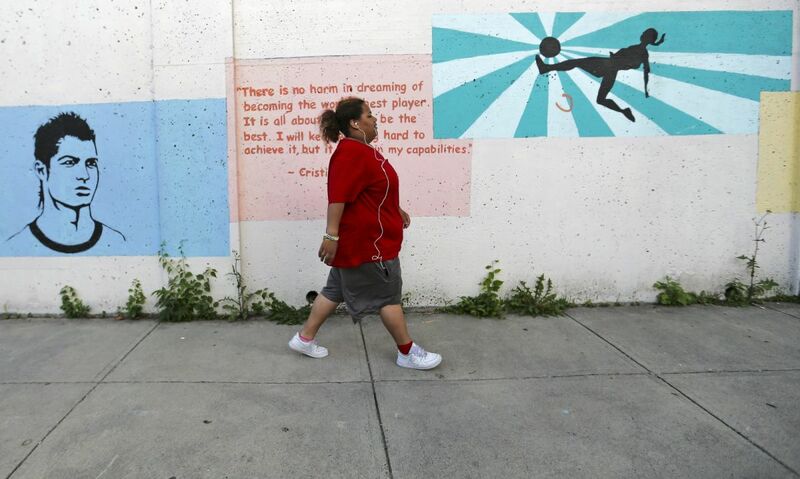 When Evelyn Correa first moved to Boston, she refused to walk around her neighborhood alone. 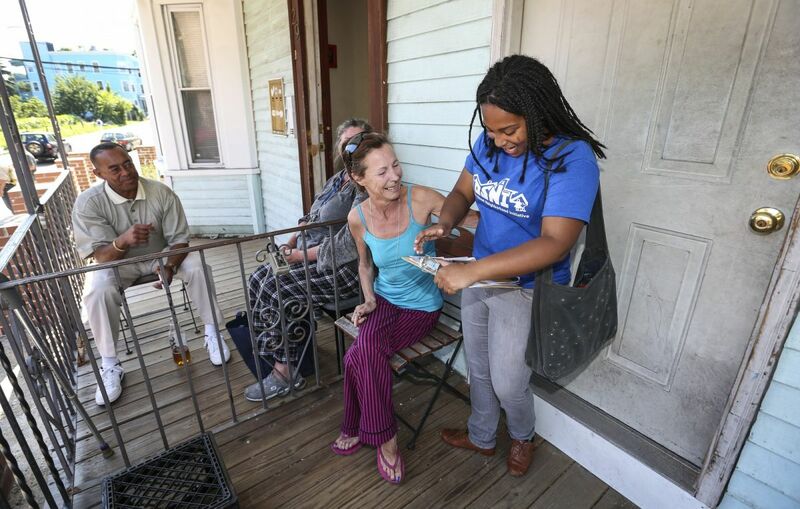 Arriving in the city in 1987, she moved in with her husband and his parents in the Upham’s Corner section of North Dorchester, then a blighted area in a floundering city. 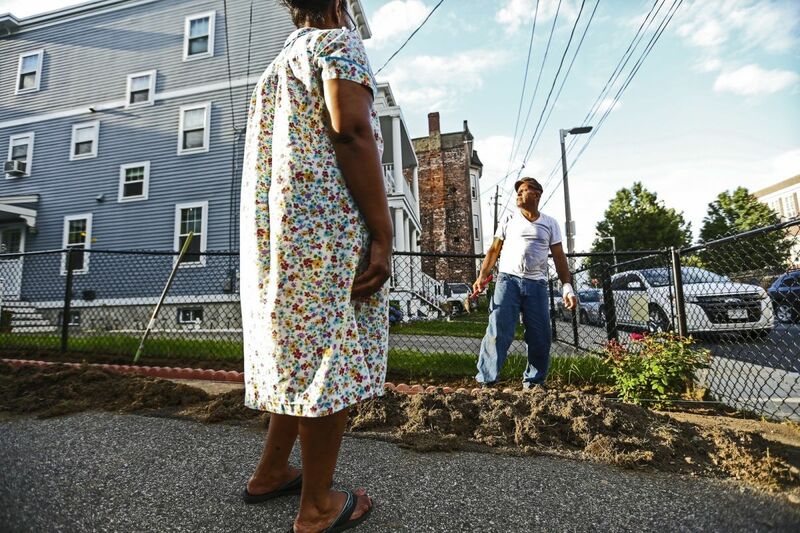 Their new home was at the heart of Boston’s urban crisis, a chain of neighborhoods in Dorchester and Roxbury that had been redlined into instability and crisis decades earlier. Today, Correa’s home and her neighborhood are wholly different, in large part due to the Dudley Street Neighborhood Initiative (DSNI). 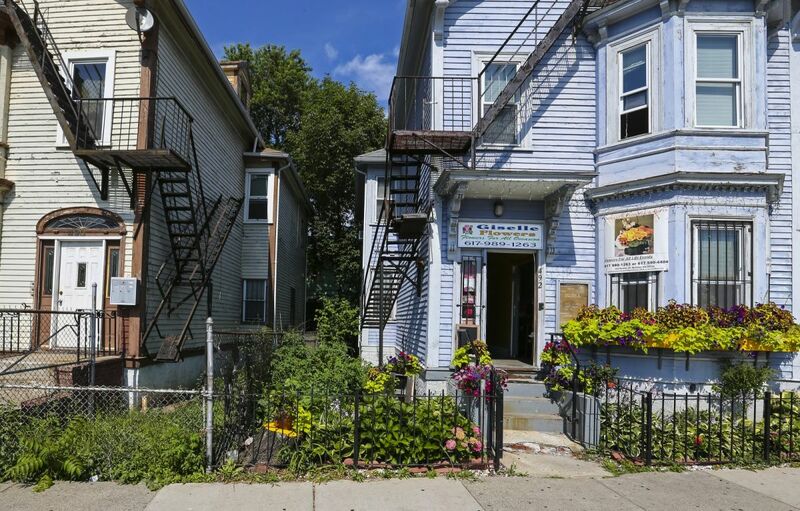 During the 1980s, this energetic neighborhood organization convinced the city that it could steward and revitalize its surroundings and did so using a then unheard of method: a community land trust. Through their land trust, Dudley Neighbors Incorporated, DSNI took possession of most of the dozens of vacant lots that pocked the area, either by purchasing them from private owners using foundation money or obtaining them for almost nothing from the city. DSNI then removed the properties from the private market, leasing them out to developers under Dudley Neighbors, with the caveat that properties remain permanently affordable. Correa’s house belongs to her, but the land beneath it belongs to Dudley Neighbors, which will ensure that if she ever sells, it will be to someone of a similar income. Dudley Neighbors is the largest big city housing land trust, by number of housing units, in the United States. The group owns over half the acreage in a 62-acre corner once rife with neglect; today vacant lots can be counted on one hand. Two hundred and twenty-five permanently affordable homeownership and rental housing units now sit where weeds once grew tall and trash piled high. The most notoriously blighted parcels in the area were transferred to the land trust and have been transformed into a beautiful park. 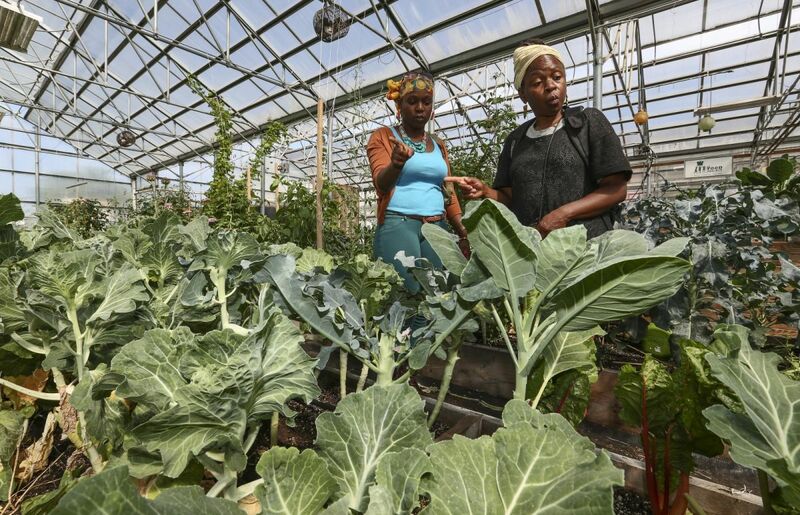 A large greenhouse and an urban farm also sit on its land. Correa’s neighborhood is not the only part of Boston to transform over the last few decades. The city as a whole is a far more prosperous place than it was in 1987. One of the big city winners of the postindustrial economy, Boston has experienced record growth in recent years, sending rents skyrocketing across the city, even in working-class enclaves like Dorchester and Roxbury. A report released earlier this year found that 38 percent of Boston homeowners spend over a third of their income on housing, while the average rent is $1,857 per month. By contrast, Correa, who owns a three-bedroom home in the land trust, makes $940 in mortgage payments every month. Many struggling renters can only fantasize about the stability of Correa’s situation. The policies that once made it feasible to live without fear of a rent spike are suffering a slow yet inevitable death with the number of rent-controlled or public units dwindling nationwide. More market-friendly affordable housing subsidy programs such as Section 8 and low-income housing tax credits remain politically palatable, but their affordability restrictions don’t come with the same guarantee of forever. Building owners can opt out of the Section 8 program, while tax credits expire after 30 years. In both cases, private partners usually decide to continue providing affordable housing, but the U.S. Department of Housing and Urban Development finds they are substantially less likely to do so in neighborhoods where they can make more from renting or selling market-rate housing. Permanently affordable pockets like the units guaranteed by Dudley Neighbors are urban unicorns so rare that outside of public policy circles, they remain virtually unknown decades after their introduction to U.S. cities. Dudley Square neighbors relax on their porches. There are numerous variations on the community land trust model, but in the basic framework a nonprofit obtains land, removes it from the market and allows it to be used based on the needs of the neighborhood residents. Typically, the organizations are led by a mix of community members, residents of the land trust, and sometimes, political representatives. Creating a nonprofit is the easy part. Land acquisition is where it gets tricky. In most cases, trusts must rely on massive subsidies or, like DSNI, being in a neighborhood before anyone else wants to be. 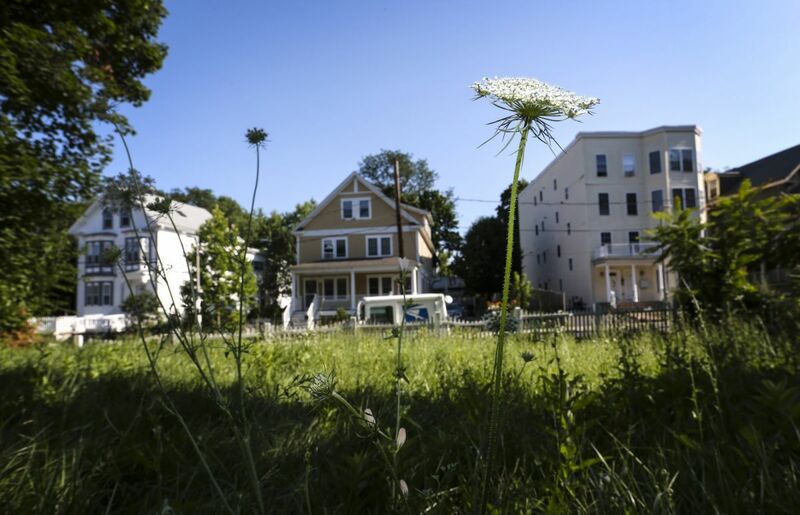 In Dudley Square, the trust was able to convince the city to sell them 15 acres of blighted land for less than $500 because, well, no one else knew what to do with it. Once land is secured, the unique aspect of the model comes into play: The trust begins to sell or rent houses with permanent affordability established through 99-year leases. In addition to guaranteeing that the property will remain affordable in perpetuity, the 99-year ground lease allows the trust to intervene if there is a mortgage default or deferred maintenance. Nested in these long-term leases are other provisions to ensure permanent affordability, often including a preemptive purchase option that gives the land trust first dibs on the house if it goes up for sale. In that scenario, the home’s price is determined by an affordability formula set below the market rate. Homeowners are allowed to recoup a set amount of value — say, 2 percent for every year they owned the house — in addition to the cost of any improvements they’ve made. Because the trust owns the land, its members can provide oversight to the deals, reviewing the mortgages of those who are buying homes on the land and providing a defense against predatory lending as well as foreclosure. A study by the Lincoln Institute of Land Policy found that by the close of 2010, homeowners who owned inside a community land trust were 10 times less likely to go into foreclosure than homeowners who weren’t part of a land trust. One thing to remember is that just like no two communities are identical, no two trusts are exactly the same. In Seattle, for instance, the Homestead Community Land Trust does not have the single community focus of Dudley Neighbors and instead, owns units scattered across the city. There are even instances where an organization only keeps its right to repurchase buildings at an affordable price, but doesn’t hold on to the land itself. But while the world of land trusts is a diverse one, it remains small, with less than 300 trusts nationwide. Despite widespread interest in the model, its spread remains slow due in large part to the difficulties of obtaining the necessary levels of funding, staffing and political support to bring a land trust to scale. It is especially challenging in the gentrifying cities that need permanent affordable housing the most. A glimpse at the membership rolls of the National Community Land Trust Network demonstrates this unfortunate paradox. There are around 25,000 affordable rental units and 13,000 to 15,000 affordable homeownership units among its member organizations. The largest of them, Champlain Housing Trust, centered in Burlington, Vermont, hosts the largest number of trust units in the United States, with 1,800 rental units and 520 homeownership units. But Burlington is a city of only 42,000, and the land trust stretches over three counties with a population a bit over 200,000 (a third the size of a Boston or Seattle). Land trust-protected units in major economic centers are few. There is no foreseeable way to bring into land trusts the tens of thousands of units that would be needed to seriously assuage the housing crisis in hot-market cities as the price of land — and housing — continue to skyrocket and more working- and middle-class people are forced farther into the distant suburbs. The earliest community land trusts were created in the aftermath of the great civil rights victories of the 1960s. The first was established outside Albany, Georgia, in 1969 by movement leaders who hoped to secure ownership of agricultural land for poor African-American farmers. Until the 1980s community land trusts were based in rural areas and housing remained a secondary concern. The first urban effort began in 1981, in a Cincinnati neighborhood where community leaders feared that rising housing prices would push out their constituents. The 1980s proved a seminal decade as the number of land trusts exploded from 12 to 120. Some thrived, like Dudley Neighbors Incorporated, but many urban land trusts didn’t make it to the end of the next decade, and a few even failed spectacularly. Philadelphia’s Manos Unidas managed to obtain properties, but secured only a few badly damaged units. The mostly volunteer staff didn’t have the sophistication to maintain the trust and the organization fell apart. The people in the houses, meanwhile, were poorly informed about the technicalities and didn’t realize that, with the land trust defunct, they now had to pay taxes on the land and the house. Several of their properties nearly went into foreclosure, and were only saved after excruciating political and community effort. The North Camden Community Land Trust, across the river from Philadelphia, collapsed in 2007 because local banks would not allow it to refinance its loans after the Great Recession. But the new century has mostly been kinder to the community land trust model. After a period of stagnation in the 1990s, a 2011 survey found 242 community land trusts. Today there are more than 280. Interest is growing. “Community land trusts seem to come up with a very pleasant glow around [them] at almost every housing conference or ideas forum that I attend,” says Lawrence Vale, professor of urban design and planning at the Massachusetts Institute of Technology and author of From the Puritans to the Projects: Public Housing and Public Neighbors. Almost three decades after its founding, Dudley Neighbors Incorporated is one of the most frequently cited examples of a successful community land trust. But it was created before the current wave of gentrification in select American cities, in an entirely different historical moment in Boston, when the main threat facing Roxbury and Dorchester was not displacement but divestment. In some ways, the Dudley experience is instructive, yet in others, it illustrates the challenge of bringing a trust to scale in 2015. A neighborhood resident walks past a community mural. In the early 1980s, Dudley Square and Upham’s Corner, redlined long ago, were horribly scarred by blight. Several chop shops were operated out of the neighborhoods. Abandoned cars dotted the back streets; in 1986 a Boston Globe reporter counted 12 on stubby Monadnock Street alone. Rats were said to outnumber humans three to one. The neighborhoods were a part of Boston’s arson belt, stretching across the city’s predominantly black and Hispanic neighborhoods, where landlords tried to extract some return on their increasingly dubious investments with a matchbook and gasoline. In 1980, “the per capita income of the Dudley Square residents was one of the lowest in the nation, on a par with the poorest counties in Mississippi, or Indian Reservations of the West,” read a Boston Redevelopment Authority (BRA) report. “When I first came here there was a lot of trash and vacant lots,” says Correa, who became involved with DSNI because her children attended the organization’s charter school. “All of a sudden you would see the fire — you would see a home going up in flames and they would be like, oh, that was an insurance job.” The plague of garbage became the rallying cry of the organization that would become Dudley Street Neighbors Incorporated. In 1986, the first meeting of the group’s “Don’t Dump on Us” campaign drew over 100 residents and prompted a visit from Mayor Ray Flynn (who arrived midway through after being alerted that a large group of voters were organized and angry). Soon enough, the city was removing cars and assisting in the cleaning of vacant lots and within several years, it had essentially gifted DSNI the lots that were in public control with the hope that the nonprofit would be able to develop them. A series of community meetings established a neighborhood vision for the blighted land, one distinctly different than a Boston Redevelopment Authority proposal that suggested hotels, high-rise offices and luxury housing. 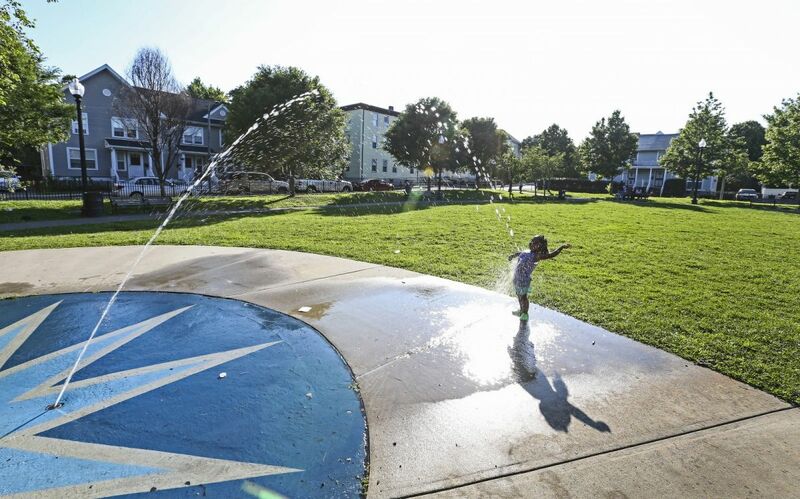 DSNI’s neighborhood plan was fleshed out by architects and a planning firm hired to add technical details to the community’s call for playgrounds, parks, a small business-oriented main street and 500 new homes. “We are not naive for taking this on. We live here, and if we don’t look out for us, who will?” said Che Madyun, then-president of DSNI, in an interview with the Boston Globe. But privately owned lots were an even bigger part of Dudley Square’s problem and here DSNI’s land trust experience diverges dramatically from the norm. The community group pushed the Flynn administration to grant it the power of eminent domain over privately held vacant land in the neighborhood — and after some wrangling, the Mayor acceded to the demand. No other land trust in the nation enjoys such powers. Almost three decades after the land trust was created, the number of vacant lots within Dudley Triangle can be counted on one hand and litter is no longer a problem. The retail mixture is nothing fancy: bodegas, nail salons, barber shops and pizza joints, with a few unique neighborhood locales like the Ideal Sub Shop, which sells submarine sandwiches with a Cape Verdean twist. While the land trust includes fewer than half the 500 affordable housing units promised in the late 1980s, neighbors are happy with the mix of residential, commercial and open space development and say the trust has opted to build a community, instead of solely housing. A child cools off in a fountain. Indeed, neighboring Somerville is facing intense development pressures and community groups have expressed interest in a land trust. But the area has already experienced dramatic increases in housing costs and resultant displacement. “This would have been a great idea to get started a few years or a few decades ago, I’m afraid,” says Vale, the MIT housing professor, in reference to Somerville. Meanwhile, the nascent Chinatown Community Land Trust just lost a bidding war with a local developer over one of its first attempts at acquisition. It has yet to obtain any land. 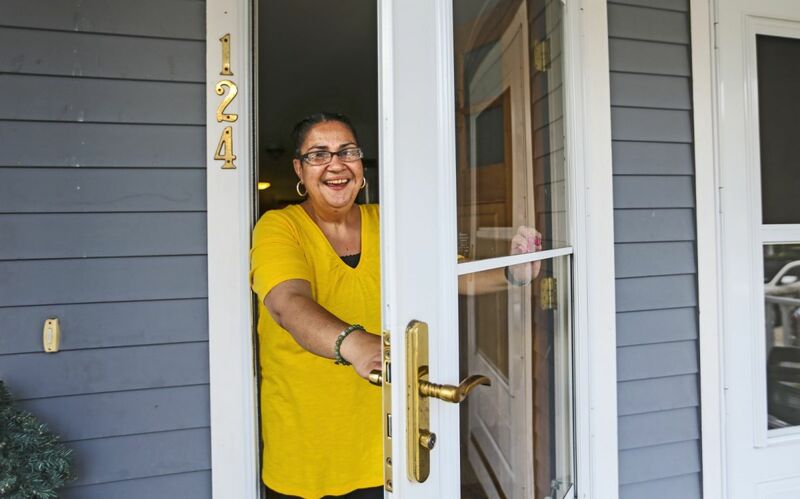 In Seattle, it took Homestead Community Land Trust 10 years to bring its first house into its portfolio and 22 years after its founding, the trust has not been able to obtain land on the cheap from the city. Though the trust was founded in 1992 to preserve affordable housing in the Central District, once Seattle’s premiere African-American neighborhood, today only six of their 191 homes are located in the neighborhood because of the high cost of land there. “One of the most significant challenges of our work has been getting access to city levy funds,” says Kathleen Hosfeld, executive director of the Homestead Community Land Trust, who notes that the trust serves teachers, healthcare workers and nonprofit employees, all of whom earn less than 80 percent of Seattle’s relatively high area median income. Without access to the enormous reserve of vacant land that Dudley Neighbors revitalized, and with limited access to city funds — Seattle’s affordable housing levy is mostly targeted toward renters, and Homestead only offers homeownership units — the organization’s acquisition strategies have been scattered over a wider geographic area. Before the recession, they helped those eligible for down payment assistance acquire a home, and then remained in control of the land beneath it. After the crash, they partnered with other community development nonprofits and created a program to rehab buildings or obtain foreclosed properties and land. The result is a housing stock concentrated in already affordable areas of the city, mostly Rainier Valley and West Seattle, with other holdings scattered throughout the rest of the city. Though Mayor Ed Murray has made affordable housing a priority and mentions community land trusts several times in his administration’s sweeping affordable housing agenda, Homestead does not work directly with the Mayor’s office as DSNI and its land trust did in Boston. “I’d be surprised if [Mayor Ed Murray] even knew we existed by name,” says Hosfeld. The success of a community land trust hinges on both the ability to establish and maintain a strong community group that maintains persistent involvement from members and a democratic structure to ensure collective decision-making. But money, and a lot of it, is needed to buy land and recruit talent to develop that vision in a successful and productive fashion. It is arguable that the Dudley Street Neighborhood Initiative prospered not only because of help from the city but because Boston is home to an unusually robust philanthropic community. Dudley Street won significant investment from the Ford Foundation but also from a variety of local institutions. There are 225 homes in the Dudley Square Land Trust. The answer could involve a greater role for local government, a prospect that makes some housing advocates wary. Over the past decade, municipalities have begun expressing greater interest in community land trusts as a means of stabilizing population or housing stock. In cities from Chicago to Flagstaff, local governments themselves have been initiating their own land trusts. (In both of those cities, land trusts were established in 2006.) This greater municipal buy-in has the potential to attract necessary resources to these efforts but also carries risks of its own. Community land trusts frequently have local political representation on their boards, but not in control of them. And as the histories of the nation’s housing authorities have shown, direct local government control can carry a serious risk of opacity, corruption and patronage. Land trust experts like Jacobus fret that without a majority of community representatives on the board, these newfangled institutions will not be responsive to the interests of the neighborhoods. Instead they would prefer governments remain an outside partner, albeit a supportive one. In Dudley Square, the future will likely include more direct municipal government support. Community land trusts were identified as a means to “mitigate the impact of gentrification” in Mayor Marty Walsh’s ambitious affordable housing plan, and the DSNI itself is in talks with city officials about a steady source of acquisition funds that could allow the land trust to compete with private developers for new parcels. For-profit or nonprofit partners will likely develop the lots, as long as the final product ends up on the land trust. For Correa, new houses can’t be brought online fast enough. “People are always asking me, so, do they have any more houses, is anyone moving out,” she says. Keep up with the best reporting on cities. Sign up for our weekly or daily newsletter.